I can’t recall where I found this recipe but it’s been in a pile of “must make eventually” recipes that seems to get larger and larger by the week. Anyway, I pulled it out and mixed up a batch recently just to have an excuse to use my new KitchenAid Pro 6 mixer. 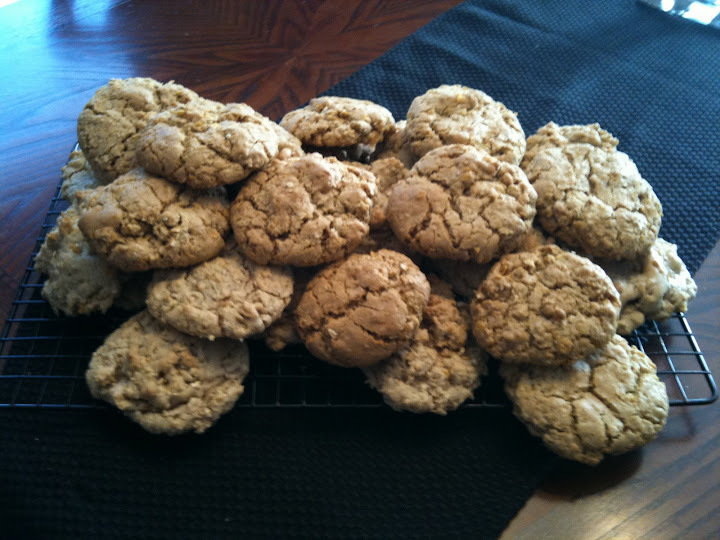 They are wonderfully simple, with oatmeal and corn flakes in a basic cookie dough base. The other great thing is that this recipe makes several dozen at once (or a couple dozen really large cookies). Cream sugars, vanilla, butter/oil, and eggs in a large bowl – about 2 minutes on low to medium speed. Add flour, soda and salt and mix until well-blended – about 3 minutes. Drop by 1/4 cup onto ungreased cookie sheets. I prefer to do this by hand, rolling the dough into balls for nicely shaped cookies with crackled tops. Bake for 10-12 minutes until edges are lightly browned. This freezes well as both a dough and as a finished cookie. To freeze the dough, roll into logs and wrap with plastic wrap and then foil. The dough should keep indefinitely. You can also store the wrapped rolls inside a larger zippered freezer bag.